Leading Manufacturer of Oil Bottle Handle, Water Bottle Handle, Bottle Carry Handle and Plastic Bottle Handle from Kolkata. Due to the increasing demands of our customers, we are engaged in offering an extensive range of Oil Bottle Handle all over the country. It has a tight grip and needs least maintenance. In addition to this, Oil Bottle Handle is designed by the trained members of our industry with creativity and new ideas. Further, we offer Oil Bottle Handle at nominal price. As we are considered as one of the leading companies, our company is also engaged in offering a wide range of Water Bottle Handle. The entire range of our products is made up of high quality base material bought by the reliable vendor of the industry. Water Bottle Handle is robust in nature and ensures longer functional life. We are offering Water Bottle Handle at reasonable rates. Being one of the largest companies, we are involved in a quality range of Bottle Carry Handle. For the benefits of our customers, Bottle Carry Handle is stringently tested by the quality inspectors and is authenticated as per the international standards. The Bottle Carry Handle we offer is dimensionally accurate and ensures longer service life. As one of the renowned organizations, we are involved in offering a wide range of Plastic Bottle Handle. 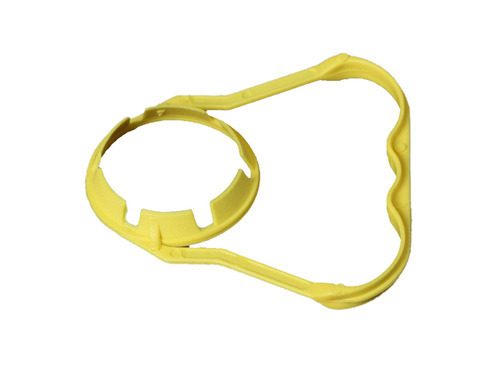 With the use of most modern machines and latest equipment we make Plastic Bottle Handle. Made up of high quality plastic material this Plastic Bottle Handle offers longer durability. High tensile strength and reliability are some of the main features of Plastic Bottle Handle.